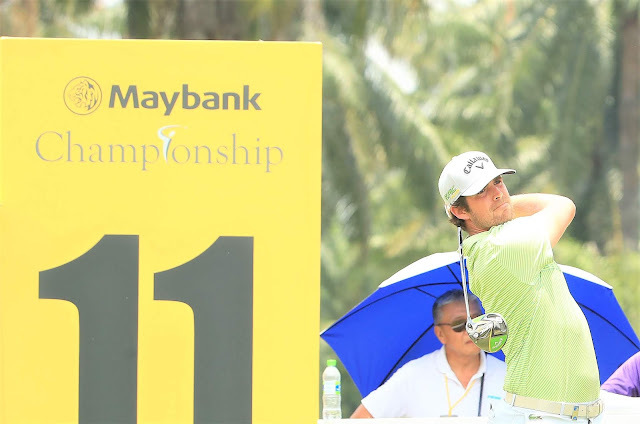 Nacho Elvira, pictured above in action today, has a first European Tour title in his sights as he takes a two-shot lead into the final round of the Maybank Championship. Spaniard Elvira, a four-time winner on the European Challenge Tour, missed five straight cuts at the start of the season before finishing second in his last event in Qatar. He closed his third round at Saujana Golf and Country Club with back-to-back birdies to sign for an impressive round of 66, which moved him to 13 under par and gave him breathing space at the top of the leaderboard. David Lipsky of the United States sealed his second European Tour win at this season’s Alfred Dunhill Championship and he is Elvira's nearest challenger on 11 under par after carding seven birdies and two bogeys in his third round 67. Germany’s Maximilian Kieffer, Jazz Janewattananond of Thailand and Australian Scott Hend are in a tie for third at ten under par, with the latter producing a crowd-pleasing moment when he found himself in the trees on the last and chose the perfect angle to bounce his third shot off the grandstand and onto the green. Four-time Major winner Ernie Els and Frenchman Benjamin Hebert, whose 65 was the lowest round of the day and the joint lowest of the week so far, are at nine under par, with England’s Oliver Fisher one shot further back. Nacho Elvira:“The putter worked a bit better than yesterday, especially coming down the stretch. I'm very happy with a 66. It was tough with the heat and humidity today. I stayed patient and it paid off in the end. “The confidence is coming back little by little. It was a tough start of the season with the driver especially. I worked really hard with the Callaway guys to get the driver ready, I think it's working. I'm hitting more shots from the short grass so I'm happy. “My game is feeling pretty good. These last two days I've figured something out and just started clicking. The last two or three weeks my putting has held me back, but I've been putting well the last two rounds. I'm excited for tomorrow. “It's a tricky course so you're going to make bogeys out there, you've just got to make your share of birdies. If I can keep making birdies like I am, I think I'll be alright. “We had 120 to the bottom of the board for the third shot on 18. I had to try to hit a six iron 140 to hit the Maybank sign for the angle to get the ball to bounce back onto the green. “I didn't have any other shot. Couldn't go above, if I went low it would have stopped on the green. Just went six iron and a low punch off the board. Benjamin Hebert:“I hit a lot of greens today, missing only the first and the last. In the middle it was great.“It was tough yesterday afternoon. I felt like I played good but it was very tough. I played in the last group and finished quite badly so I was happy to play very early this morning. “It's very, very hot and humid so we are sweating all the time, everything is wet. I have a towel that I put in ice every hole to refresh myself but it's very tough.